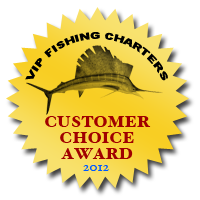 Our Fort Lauderdale 3/4 day fishing charters are 6 hours long and leave from our docks in Fort Lauderdale. Our Fort Lauderdale three-quarter day fishing charter is a good compromise between our half day and full day charter. When we go fishing ourselves, we typically choose the 3/4 day / 6 hour trip. That extra two hours provides a lot of extra time for fishing, which can make a huge difference in the amount of fish you can catch. It gives our captains time to move around a little more and get farther offshore if needed. Fort Lauderdale is nice because our boats are located so close to the best fishing areas. We're only twenty minutes from the inlet in Fort Lauderdale, and the twenty minute ride out takes us past some of Fort Lauderdale's most beautiful waterfront mansions and multi million dollar yachts. With our six hour trip, we can spend a little more time exploring the intracoastal and touring the city. Just let us know if that interests you. Truth be told, most of our customers just want to maximize their fishing time. On our 3/4 day charter, we'll provide everything you need for fishing including the boat, a captain and mate, all the fishing equipment you'll need, plus frozen bait and lures. Depending on what we're fishing for we may recommend the use of live bait. In this case, we add the cost of purchasing the live bait onto the price of our fishing charter. Some charters try to keep this a secret. We hate doing business that way and we'll tell you ahead of time if we think live bait is a good idea. You can always say no, but it'd be a real shame to miss out on the big fish if they're biting that day! A lot of the fish we catch in Fort Lauderdale is edible and anything you catch belongs to you if you want to keep it. Our friendly Fort Lauderdale crew will clean and filet all your fish for you, and package it in sealable containers so you can take it home or to a local restaurant to be cooked for you. We can recommend some of the best restaurants in Fort Lauderdale to cook up your catch. It's cheaper than ordering one of their other dishes and you get all the advantages of having an expert chef prepare your fish for you. Most of the time, these restaurants have a set price that includes preparation and side dishes. Besides live bait, the only other thing we don't include in our standard 3/4 day pricing is gratuity for the crew. Of course, gratuity is at your discretion, but 15% - 20% has become customary in the Fort Lauderdale area if you feel the crew did a good job on the fishing charter.